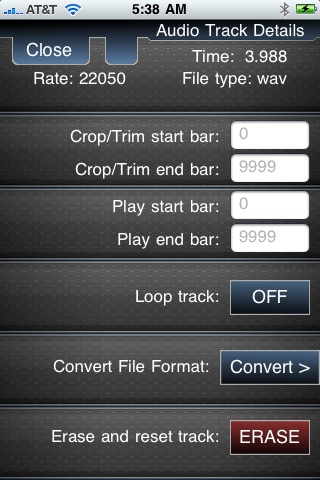 This view controls the crop region, start and stop position, and loop enable for a specific track. These controls are active for playback, mixdown, and record (even if you are overdubbing the specified track). You can also convert the file format or erase the track. Controls the region of the track that is played. Say that you have a track of 40 bars, but you want to skip the first 8 bars and only play bars 8 through 16. Set the Crop/Trim start bar to 8 and the Crop/Trim end bar to 16. Determines where in the song the track will play. Say that you just want to play over the 2nd chorus at bars 36 through 43. Set the Play start bar to 36 and the Play end bar to 43. Easy? Determines where in the song the track will play. Say that you just want to play over the 2nd chorus at bars 36 through 43. Set the Play start bar to 36 and the Play end bar to 43. You may want to convert an audio track (file) to reduce the size of the file and free up space on your device, or to match the file type expected by your desktop audio software. Under this same menu is the bounce facility, which lets you copy a track (file) or cropped section of a track to a new track. The new track can be in the current project or in another project. Erases the entire audio track (file) and resets all controls for that track.